From the middle of the fifties and about the same time as the Mini was developed, Fiat had been experimenting with front wheel drive. During the early sixties Fiat allied their front wheel drive concepts with the obvious weight and cost advantages of three and two box transverse engine configurations. By 1963 they had three versions of front wheel drive prototypes around, including the forerunner of the 128. 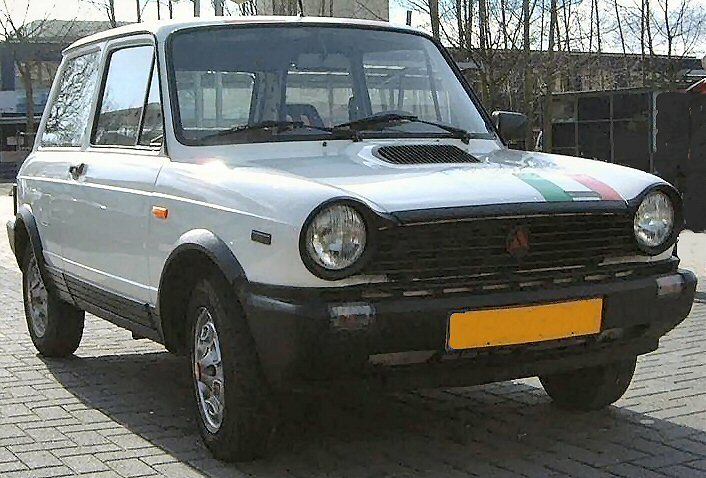 But they were very nervous about its launch in Italy and so decided to 'market test' the concept under the Autobianchi brand instead, initially as the Autobianchi Primula - also coded the Autobianchi A111. 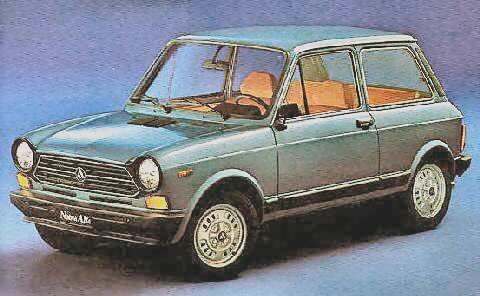 A smaller version of the Primula was already penned, and Autobianchi proceeded to bring this to market rapidly, so as Fiat produced the 850 series Autobianchi launched the A112 taking full advantage of 850 mechanicals but in another front wheel drive and transverse engined car. The Autobianchi history begins with Edoardo Bianchi in 1899, initially making bicycles, and in 1901 the workshop produced a first motor driven bike. By 1905 they produced their first auto in competition with Fiat's own 12HP. But war and investment problems during the 1920s and '30s left Bianchi as a backwater. In 1955 Fiat and Pirelli helped re-launch the company with the 1957 Bianchina - under the Autobianchi name. A smaller 2 seater followed, using Fiat 500 running gea, then an estate - the Panoramica. And Fiat continued to use the company as a technical and marketing test bed. This was never more important to Fiat when they tested their first front wheel transverse engine design in the Autbianchi Primula (and A111) from the mid sixties. The outstanding popumarity of the A112 followed on from 1969, and when Lancia joined the Fiat Group Autobianchi' was moved into the Lancia organisation, but retained a presence during the early years of the Y10 when some models were badged Autobianchi. And so the Milano company was finally absorbed into Lancia. In October 1969 Autobianchi launched the A112, and it proved very popular in Europe, continuing to being built right up to 1985. 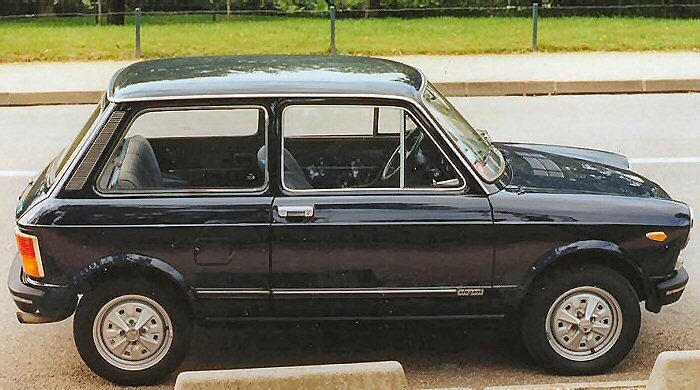 Autobianchi's approach was to market Fiat's engineering with additional comforts - rather like Lancia where to do later, and in fact A112s were sold through Lancia distributors in some countries. Within two years, in 1971, Fiat's newly acquired performance specialists, Abarth, had launched a faster version of the A112 and another little classic was born. So Autobianchi made the A112 into a more refined version of the Fiat 850 saloon. It was designed with a wheel base of 203.8 centimetres and could comfortably carry four adults with some more luggage room. The rear seat also dropped down to extend the luggage space if needed. Mechanical components were derived from the Fiat 850 series, with its synchro box and anti-clockwise rotating engine taken from the 850 Sport, and delivering 44 bhp from its 903cc's. Emulating the 850 original, the car was light, weighing around 680 kg and therefore providing a good power to weight ratio for the time. The A112 reached a top speed of 135 km/h, with an acceleration of 0 -100 km/h in about 15 seconds. behaviour were quite novel for the time and a contrast to the rear engined 850 saloon. It was an excellent little performer.... and there is a good case to say it was one of the first of the superminis! A112 production numbers are impresssive, reflecting a large and loyal following for the cars both in Italy and Northern Europe, with over 1,2 million cars sold over seventeen years. Popularity of the A112 was sustained, initially after the 1973 oil crisis, but sales continued at a similar rate into the early eighties, partly due to Autobianchi's vigorous update policy. This has produced a large series of models, numbering seven. Special versions were also made, for which seperate figures are not available from Fiat. These included the Abarth Goldring and Juventus. Perhaps the most famous of the A112 variants is the Abarth. Carlo Abarth's company had already developed a 1000cc race version of the Fiat 903cc engine and allied to the low weight and crisp handling characteristics of the A112 Abarth created another great little Abarth. Quite soon after the A112's sales launch in 1969, A112 Abarth prototypes were spotted around Milan and their Corso Marche premises. By the time the road going version was ready for production in 1971, they were producing about 100 bhp in race form. But when the A112 Abarth road version was on sale the same year they were quoted at 58 bhp - and were badged as "58" accordingly. Some prototype development work had been needed to provide a reliable transmission which was forgiving enough for everyday town use. Inside the A112 Abarth is fitted with a generous instrument panel including a prominent tachometer indicating a red line of 7000 rpm. Alongside, supplementary instruments include ammeter, oil pressure and temperature gauges. An Abarth leather steering wheel and Sport Seats complete the interior equipment. The Abarth engine, is also provided with an oil cooler, strengthened sump and heavy duty radiator as well as stiffer suspension and bushes, and an uprated transmission. The 58HP will accelerate from 0-100 km/h in about 12 seconds, with a top speed of over 150 km/h at the 7000rpm red line. Abarth's involvement with the A112 was very much integrated with the main model updates and sales throughout the seventies. In 1974 Abarth produced a new 70bhp A112 Abarth. This version was mechanically similar to the 58, and included an uprated fuel pump and distributor mount, but especially an upgraded brake system with servo assistance. From 1977 the servo was dropped, Abarth favouring a bigger master cylinder instead. Autobianchi also produced a revised interior for the 1974 A112 'Elegant' with carpets throughout the car - including the rear luggage area, and full a cloth interior trim with matching seats. A tachometer was also included in the instrumentation. The engine was as standard with the 903cc 44 bhp configuration. The first of these models had a two-color finish, and thick impact bumpers, but the two tone cars were quickly discontinued. In 1975 A112s were given the now classic larger rear lights. And by 1977 some 600,000 A112s had been made. The first major update of the model came in 1978. The roof line and height were changed and the frontal look revised with a new plastic grill. Its tail light clusters were again revised, and plastic impact bumpers added, with coordinating black plastic side strips. Engine capacity was also increased for the 'Elegant' to 962cc giving 48 bhp as standard. At the same time the transmission was strengthened. The interior, and instrument binacle was changed too - out went the original instruments in favour of Lambourghini derived equivalents... and the auxiliary instruments in the Abarth version were now dropped below the eyeline. The Abarth versions now got a fake air scoop on the bonnet. At the same time German importer W Hagen developed a conversion kit for the A112, comprising spoilers, Abarth rims (type CD 30, 5,5x13) and a set of wheel arch extensions, which could also be fitted to the standard A112 as new. It proved very popular although rework of the wheel arches was required to fit the larger wheels but such cars will lack the Abarth tuning and peformance modifications. Adding larger wheels to A112s is nearely as complex as modifying the Fiat 500s for the same purpose and such cars should be inspected carefully. In 1980 the A112 recieved some further updates with heavier used of plastic on the doors and rear flanks, and matching black plastic wheel arches but the mechanical components remained the same. Lancia took aver the marketing of the model and the brand Autobianchi was dropped in some countries. Final changes were made in 1982 when the plastic bumpers/valences were increased in size and included driving lights, and the lateral strips were colour coordinated with the car. By the time the last A112 rolled off the production line in 1986, more than 1.2 million had been produced. Fortunately there are very well trodden paths based upon the Abarth develoment line and the Fiat 850s. These cars were often raced with great success in the seventies and versions of these modifications abound across the internet. The 850 sport setup in particular was quite heavily tuned as standard... and so the components are highly stressed already - for Fiats. When considering additional power, you should budget to completely renew everything.... by this I mean the cooling, carburation, exhaust system and block rigidity must be addressed, and it is essential that the transmission suspension and brakes are completely upgraded. Based upon engineering conference information from the mid nineties at which all the main manufacturers were represented, this was their best estimate for the A112 engines and ancilliary components (like carburettors and distrubutors). The question was asked - if switching to unleaded 95 Octane fuel, or unleaded 98 Octane fuel, would the engine as installed incur any reduction in life or performance that could not be accommodated during its normal service cycles? Table note: * Please note the A112A500 and A112A5000 are different engine codes!! The conclusion - as with all the related Fiat engines - is that the engines will incur no additional wear switching to 98 Octane unleaded if accompanied by a full service. Also the A112A000/ and A112A500 engines are capable of accepting 95 Octane unleaded, with a full service, but the A112A5000 and A112B1000 variants will not. This was assumed to be a one time and permanent switch onto unleaded fuel in each case. This information has prompted some discussion on the club forums - regarding the precise nature of the problems with Unleaded 95 Octane given the close relationship of these engine variants to one another. The obvious observation is that it is based on compression ratios and detonation concerns.... but for some of these engines they are not running higher compressions and the answer is we really don't know. We don't have the resources in the club to find out using anything other than a crude Observational Method. In other words to observe with owner/ members what haopens to the cars that are switched to using 95 Octane unleaded fuel down the years. So this information should be treated with caution and we cannot guarantee its validity. Bacci-Romano provide a comprehensive list of parts for the Autobianchis at www.bacciromano.com in particular the 850 rear axle parts, independent axle parts complete with stub axles and flanges to suit Fiat 850 and Abarth transaxles, and A112 differentials, cv joints etc. Go to the home page, then 'produtti....', 'listino 2006.....', then 'Autostoriche and 'Ricambi Autostoriche' sections. And here's a day out!